Want to experience the Chinese culture and sports in Orlando? Come and enjoy the fun and talent of Taiwanese Folk Art with your family and friends at Orlando Fashion Square! exchanges. Orlando is their first stop in Florida! 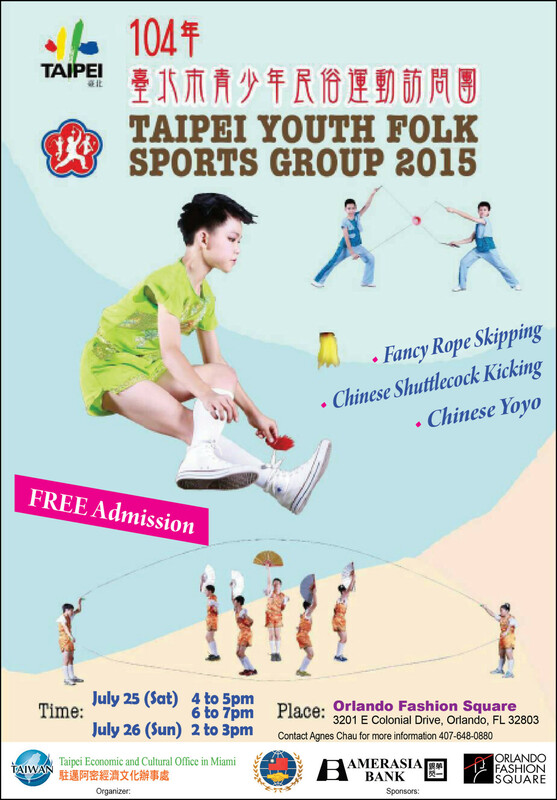 The 70-minute program showcases Taiwan’s unique rope skipping, Chinese yo yo, shuttlecock kicking, diabolo spinning, and top spinning sports while combining dance, martial arts, gymnastics and other theater performance elements. They will show the best results from their hard effort of training with precise body control and perfect cooperation of the team. Event organized by Taipei Economic and Cultural Office in Miami.